The Kings Arms Inn (marked 'B' on the 1886 map at left) had stood for many years in Silver Street but had been known as the Bunch of Grapes and the Grapes Inn and even into the 1940's had, as a sign, a bunch of grapes suspended from a wrought iron bracket (see Documentation below). It is most likely that this public house traded as the Bunch of Grapes until about 1855 when the second King's Arms, a beerhouse in South Street ceased trading, probably due to the death of its licensee, Richard Bennetts. As the new name of the King's Arms was adopted, a new establishment in Wine Street assumed the name of the Bunch of Grapes. Having said that, the pub doesn't appear as such in the 1851 census and there are no publicans listed between the Half Moon and the Pall Tavern. A major fire in 1835 destroyed the building along with several other premises. Following the fire all the premises from the Kings Arms to the Pall Tavern were rebuilt further back from the road so that Silver Street could be widened thereby easing congestion in the centre of the town. Looking at the photograph below it makes you wonder how narrow Silver Street must have been before 1835, bearing in mind that just before that time there were also small houses built up against the church boundary wall (at left in the photo). In its edition of 17 October, 1879, the Western Gazette reported " The landlord of the King's Arms Inn - a young man named Guy - died under suspicious circumstances on Wednesday night. It appeared that about 11.00pm, Mr. Guy, who had just previously shaken hands with a person in the bar, fell back in a chair and almost immediately afterwards expired. A bottle, containing some mixture, was subsequently found in one of his pockets. The mystery surrounding the case will no doubt to be cleared up at the inquest." By the 1890s the King's Arms was a tied house of the Royal Osborne Brewery, with a long lease owned by Earle Vincent. 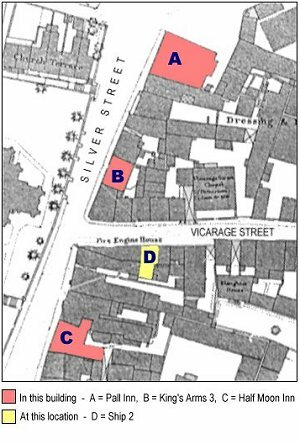 When Vincent died in 1893 his estate was sold off the following year which included "the King's Arms, Silver Street, rented by Mr JH Moore at £20 (about £2,000 per annum at today's value)." The Ministry of Town & Country Planning's Provisional List of Buildings of Architectural or Historic Interest of July 1948 described the building and its neighbours thus - "Silver Street bounds churchyard on east side. Houses on one side only, facing church. The houses themselves are mostly 18th or early 19th century in date. They are not of great merit individually but they retain their Georgian scale and form part of the pleasant surroundings of St John's church. They are therefore of value in a largely modern town. Grade III, No 9 Silver Street, King's Arms PH. Three-storey two-window painted brick front. Chamfered quoins, moulded stone gutter, flat strings. Central doorway has three-centred head and pediment on brackets. Door itself has reeded margins to panels. Above doorway is sign consisting of a bunch of grapes suspended from a wrought-iron bracket." The following description is taken from the Somerset Historic Environment Record - "Inn of c1780. Brick (colourwashed) with painted stone dressings, Welsh slated roof between coped gables, with brick stacks each end. 3-storey, 3-bays. Central doorway with segmental arch, with pair 3-panelled doors and plain fanlight over, crowned by open stone pediment on Yeovil style console brackets. Stone plinth, rustic quoins, stone bands to each floor level. Two 16-pane sash windows to ground and first floors, in plain openings with flat gauged brick arches over. Two 12-pane sashes to second floor. Stone cornice stackhead and downpipe to right-hand side. Modern inn sign on wrought iron bracket. Plain side wall. Interior much altered at ground floor level, remainder not inspected. One of a group of C18 retaining a sense of scale and variety." The first recorded licensee, Henry Trott, was born around 1823 and both he and his wife, Sarah, were from Stocklinch, Devon where, in 1851 he was recorded as a farmer of 100 acres. He and Sarah were living with his father, James Trott, a retired farmer, and Sarah his mother. By 1861 Henry was licensee of the Half Moon just along the road and in 1866 he was advertising himself as licensee of the King's Arms in Kelly's Directory. However by 1871 Henry and Sarah had moved back to Yarcombe where Henry worked as a builder. The next licensee, Thomas Godfrey, was obviously a bit of a rover; he was born in Tipperary, Ireland, around 1837 and his wife, Anna, was born in Yeovil but their first son was born in Southampton and their second son in Birmingham. In September 1870 he was refused a spirits license for the King's Arms by the Borough Petty Sessions since the Bench considered ".... the two public houses at each end of the street supplied the public necessity." He was still licensee of the King's Arms in 1871 but by 1881 they were off again, this time he was a commercial traveller living with Anna in Bristol. Hugh Marsh was born around 1838 in Yeovil, son of George and Susannah Marsh, but the family moved to Yeovil quite early in Hugh's life and by 1851 they were living in Paradise Row, Huish. His father was an ostler and even at the age of 14 Hugh was listed as a harness maker. By 1861 Hugh's mother had died but the family were still living at Paradise; Hugh was listed as a saddler while his father had become a brewer. By the time of the next census in 1871, Hugh's father had died. Hugh was now aged 33 and was still living in Paradise Row as a saddle and harness maker with his 19-year old sister, Mary, as housekeeper. However, within the next five years, after more than twenty years of making saddles and harnesses, Hugh was licensee of the King's Arms and was listed in Kelly's Directory. By 1881 he was licensee of the Half Moon, a few doors along Silver Street. By this time Hugh had married Jane Dunn and her daughter, Bessie, worked as a barmaid in the Half Moon. Thomas Luxton was born around 1830 in Cullompton, Devon. In 1871 he was licensee of the village pub in Aylesbeare, Devon but by 1881 had moved to Yeovil and was licensee at the King's Arms with his wife, Anne, and son Thomas who was listed as an innkeeper's assistant. There are no further records of the Luxtons after 1882. Joseph Banwell, listed in Kelly's 1889 Directory, doesn't seem to appear in the censuses either before or after this date and had certainly left the King's Arms by 1891 when Sarah Abbott was recorded as licensee. Sarah was born in Haydon, Dorset about 1839 and by 1881 was the wife of Walter Abbott, a farmer of 38 acres employing one man and a boy - the Abbotts lived in East Coker with their three children and Walter's mother. By 1891 however Walter had died and Sarah, now a 52-year old widow with three children was licensee of the King's Arms with her eldest son Walter, now aged 19, as her assistant. At this time the King's Arms must have been really busy as there were 18 people living in, mostly boarders. Sarah died in 1896, aged 56. John Moore took over the license by 1897 and the most noticeable difference was that by 1901 the number of boarders had dropped to three. John Harry Moore had been born in Stalbridge, Dorset around 1863 and by 1881 he was an 18-year old tailor's apprentice living with his aunt in Stalbridge. By 1901 John described his occupation as innkeeper and tailor and lived in the King's Arms with his wife, Amanda, and their son, William. By 1907 John was licensee of the Black Horse, Reckleford, with Amanda and William. Edward Courtney had been born around 1871 in Netherbury, Dorset, the son of an agricultural labourer, George Courtney and his wife Sarah. By the time he was twenty Edward was also an agricultural labourer, living with his parents in Symondsbury, Dorset. Within the next ten years however, Edward made great changes in his life; he got married to Florence, they had two sons and a daughter and they were living in Cheapside, London, where Edward was a police constable. By 1911 Edward had retired from the police and is recorded in the census as 'Police Pensioner, License Holder' and living in the King's Arms with Florence and their family. 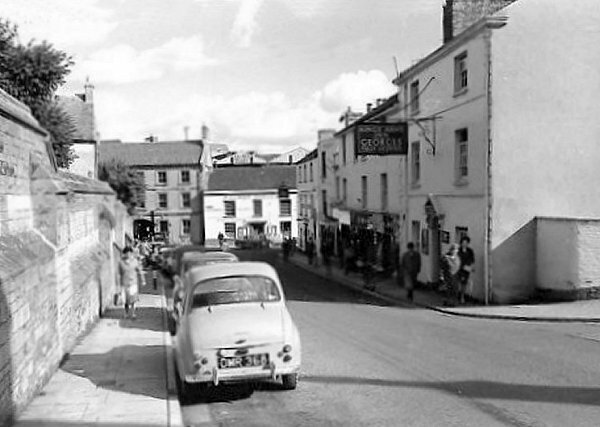 This photograph was taken in the 1960's and looks down Silver Street towards its junction with Court Ash and Market Street. 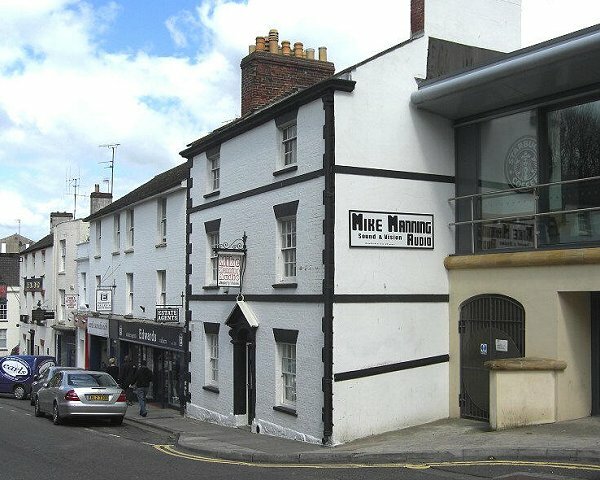 The King's Arms Inn is the three story white building at right, at the junction with Vicarage Street. 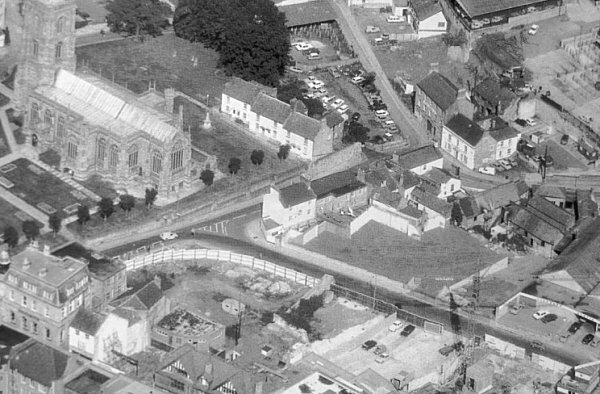 This aerial photograph dates to 1972 and shows the Kings Arms at dead centre with St John's church at top left and the cattle market at top right. Notice that Vicarage Street, running from its junction with Silver Street at left of centre in the photograph to the lower right corner, has been all but flattened and fenced off in preparation for the construction of the Quedam Shopping Centre. 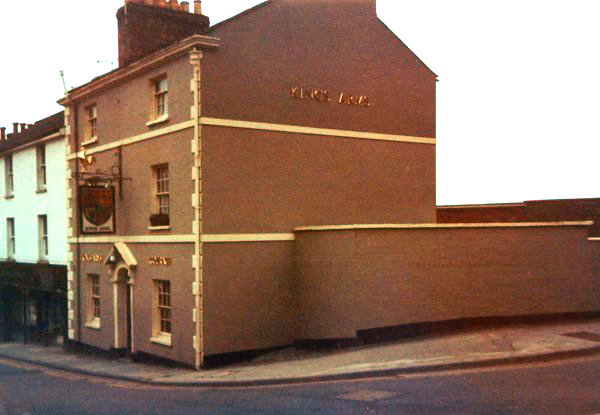 The Kings Arms, photographed in the 1970s. 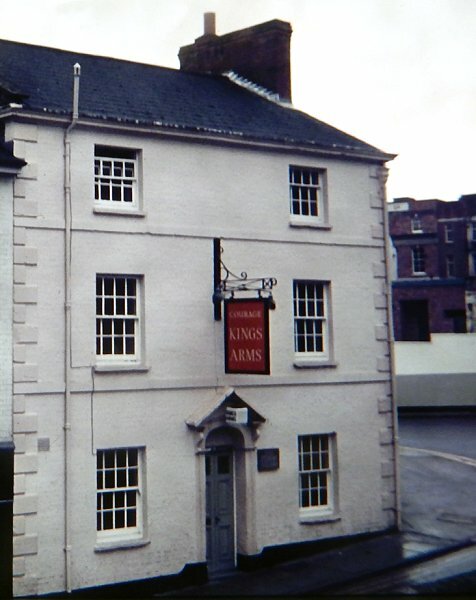 The King's Arms photographed in 1984. 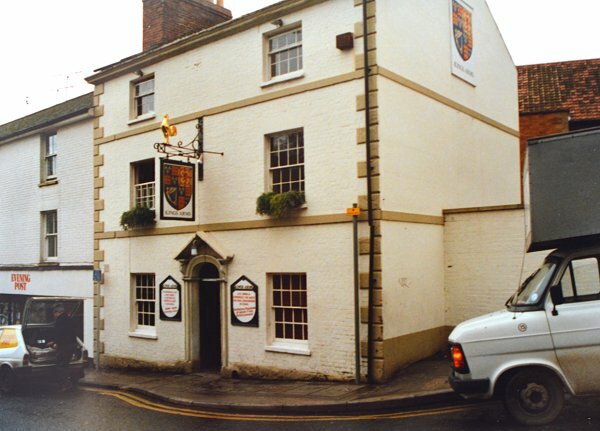 The King's Arms photographed in 1989. 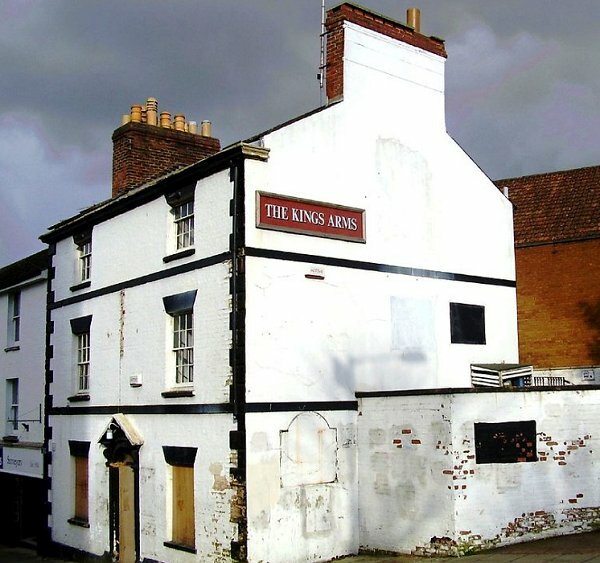 The King's Arms, photographed in 2006, closed and boarded up. The King's Arms Inn building photographed in 2012. The sign suspended out side the King's Arms "consisted of a bunch of grapes suspended from a wrought iron bracket. (Ministry of Town & Country Planning, Evaluation of Grading).